Welcome to our selection of top quality food service working equipment for your business. We've assembled it all here for you from work tables and backsplashes for work tables to commercial sinks, shelving and dunnage as well as storage products for your business. These hand items are essentials to keep your business running smoothly and help enormously with every day tasks. And as always the items come at those deep discount prices our customers have come to love. Call us today with any questions you have about these business essentials. We carry food work tables from well-known brands at great prices. We have commercial work shelves available at low prices. 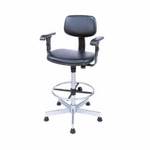 We have Nexel furniture products available at affordable prices.